Commissioned by the Lanza Institute in 1997, the Mario Lanza Mural spreads across two adjacent buildings at the corner of Broad and Reed streets in South Philadelphia. 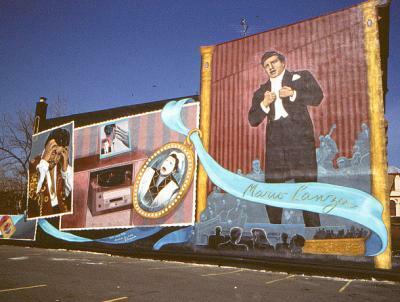 The mural depicts important moments in Lanza's life as a classical singer, recording star, and movie idol. (c) 1997 Diane Keller / City of Philadelphia Mural Arts Program, photo by Jack Ramsdale.